In April 2002, the City Counsel of San Diego undisputedly supported a plan to launch a Family Justice Center located in downtown San Diego. This organization was designed and dedicated to helping victims of domestic violence in the San Diego area. The idea was to house many different agencies and over 100 professionals of domestic violence under one roof. The vision was to unite San Diego’s efforts and expertise to provide new services, additional safety, and promote justice to victims and their children. The Family Justice Center (FJC) was going to be the first organization in the country to have the Police Department and City Attorney Domestic Violence Units and staff from many other local nonprofit agencies for domestic violence and sexual assault. This is the first time in the history of San Diego, that the community would have access to a wide range of services and the opportunity to work with many criminal justice professionals all from one location. The San Diego Family Justice Center opened its doors to the public on October 10, 2002. Victims of domestic violence can now go to a single location in San Diego to do any of the following: work with an advocate, file for a restraining order, make plans for their safety, talk to a police officer, meet with an attorney, obtain medical assistance, seek help with transportation and housing, and receive information about family counseling and support groups. Today, the Family Justice Center meets with over 500 clients and receives about 3,000 phone calls on average a month. 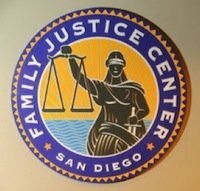 The Family Justice Center Legal Network (FJCLN) which was founded in 2008, provides free legal services to victims of domestic violence in the San Diego area. The clinic allows clients to come in on a walk-in basis without an appointment. Restraining Order requests are filed electronically with the San Diego Superior Court which relieves the victim of having to go to the courthouse to obtain legal protection from the Judge. Free child care is provided along with safety planning, advocacy and counseling services. Help in filing a Temporary Restraining Order (TRO) by collecting evidence, getting police reports, contacting witnesses, writing declarations, transcribing voice mails, taking photos of injuries, filling out paperwork and filing it electronically with the court. Court Preparation is a presentation available free to all FJC clients to help prepare them for their upcoming restraining order hearing. It provides helpful information regarding the court procedure and allows the victim a chance to ask questions about the process. Court Support is where a client can sign up to have an advocate go with them to the restraining order hearing. It provides a sense of comfort and safety for victims so they are not alone. The advocates can sit with clients in court, but cannot speak on their behalf. Dress for Success is a program that provides an opportunity for each client to get professional attire to wear to court if they cannot afford it including suits, shirts, & shoes. Safe at Home as partners with the YWCA it provides emergency shelter and safety plans. Support after Hearing by following up with clients to make sure there have been no violations of their restraining order and informing them of support groups and programs. Prior to the FJCLN, legal services were minimal and generally required the victim to go to court and appear alone before a judge without representation or advocacy. Today, victims can receive all needed services at the Family Justice Center and have an advocate accompany them to court. There are 84 Family Justice Centers around the world and another 120 in progress right now. For more information about domestic violence, please visit www.womenslaw.org. At Bickford Blado & Botros, we are strong advocates of the programs and services offered by the FJC. As one of the leading San Diego family law firms, we are long time supporters of services that help our clients going through the difficult struggles of a divorce. If you are considering a divorce, the most important first step is to consult with an experienced San Diego Family Law Attorney. Call 858-793-8884 to schedule an appointment with Nancy J. Bickford today.